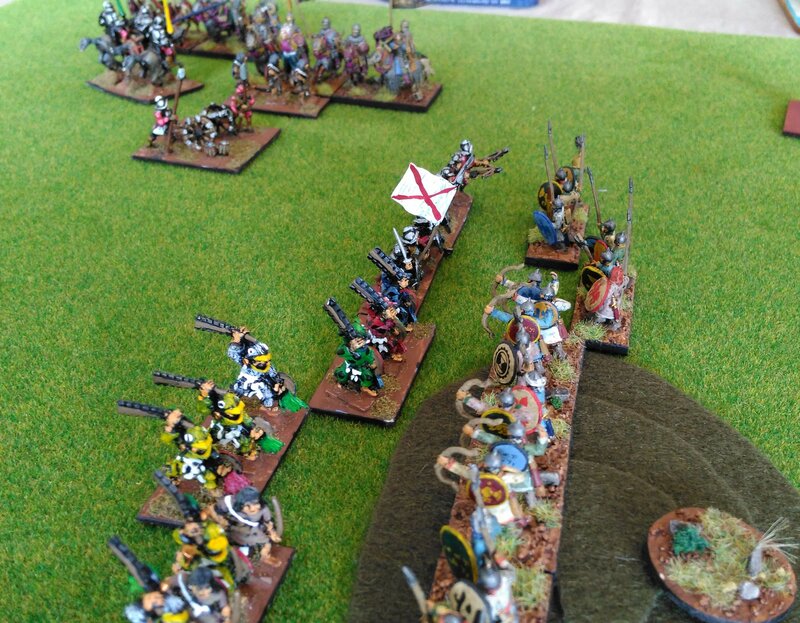 The spearmen are finished and the Samanid army is ready to take the field. The whole army is now done, and I’ve updated the Army Page for it. The whole sequence can be seen here. I had been wanting to get these figures for some 8 years or so. I had just painted the Syrians and really enjoyed how they turned out. I wanted to capture that style with these figures, but I wouldn’t be able to use LBMS transfers. The VVV transfers seemed a bit lonely on the shields, and my attempts to encircle them freehand doesn’t entirely please me. The Dailami looked good, but not exceptional. that comedown, explains why I didn’t sprint to get the next six elements done. These archers may look a bit better (and it may be the different phone’s camera that has helped). The spearmen are very close to being done; just some webbing and basing to go. Samanid archers. I’m please with how the axemen have worked out. Painting hasn’t been helped by the hot weather. The wet palette has helped, but it is a struggle to keep paint a working consistency, and I have to keep cleaning dried paint of the brush. 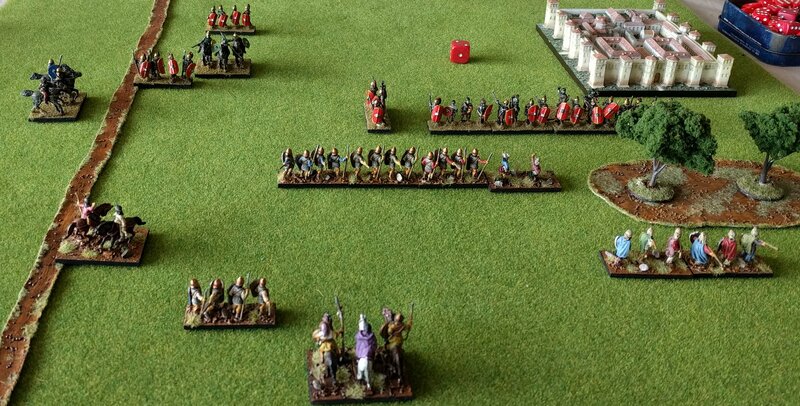 When the spearmen are done, they may be the last for a while! My Syrians are making progress towards being able to double as Samanids (III/43c). this is an army that has been a long time in the planning. If you click on the category of Samanids on the side bar, you will discover Shamanid Goblins as their precursor! DBA 3.0 removed the option of an elephant, but I do have two to paint, so in time this can become a Ghaznavid army too. I’ve always liked the Khurasan figures, but their cavalry is being remodelled. 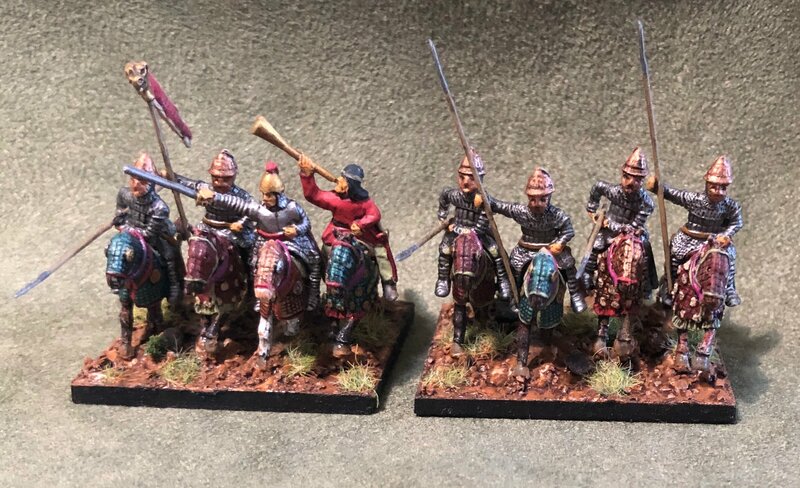 However, a spur to getting this army was the idea was that the Syrian Ghulams could be used for the core mounted elements, and it is the ghulams that make this army look so cool. 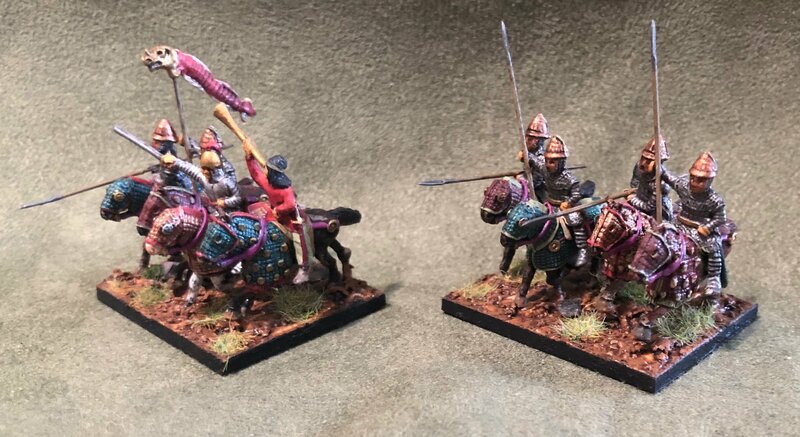 By rights the ‘noble cavalry’ should have less armour than the ghulams, but that’s not possible to see! 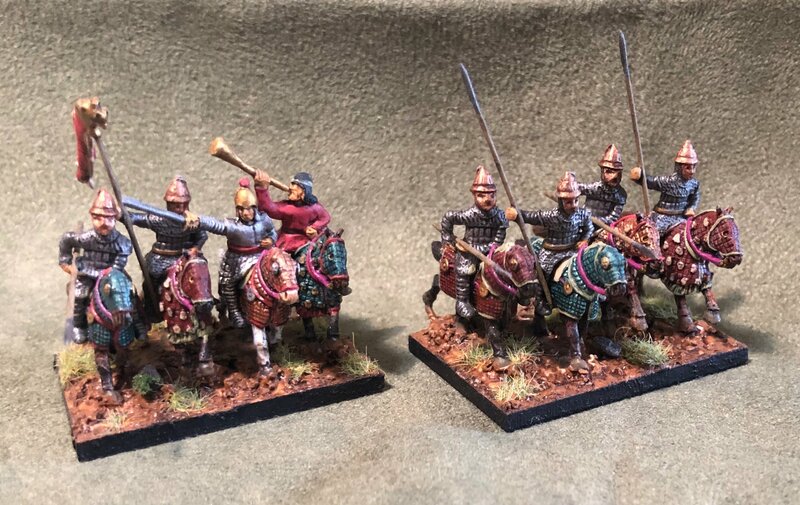 At a pinch I could take a Central Asian Turkish (III/11b) and use the Syrian Turkomen to avoid painting an element of Khurasanian horse archers (as well as get an extra LH). 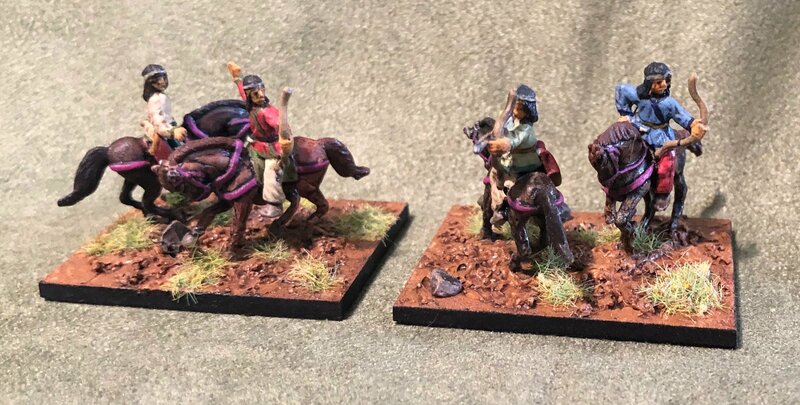 However, I have got those horse archers, as well as an element of slingers (Ps) and I’ve done the first of the core foot, an element of Dailami javelinmen (4Ax). 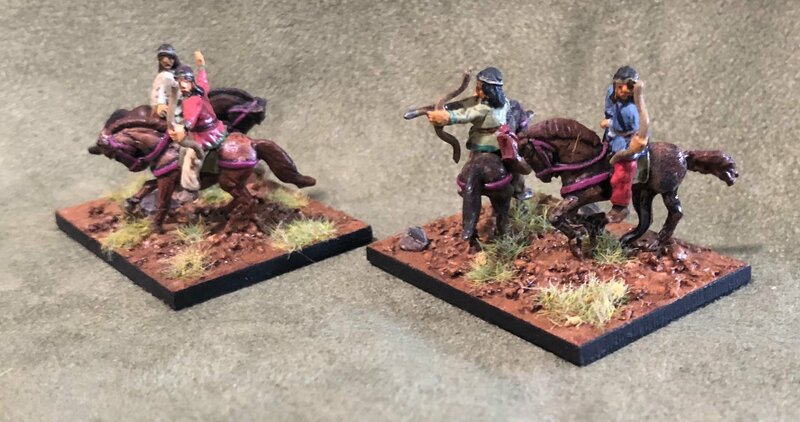 The remainder of the army are similar to these javelinmen, being Khurasan figures, and are close behind — three elements each of spearmen (Sp) and bowmen (4Bw or Ps, but I’m only doing the 4Bw). The peasant levy is an element that would be the Syrian Adhath militia, if I chose to take it, but I see the slingers as being more useful. Therefore, the army is now halfway complete. From left to right, slingers, Dailami javelinmen, and Khurasanian horse archers. 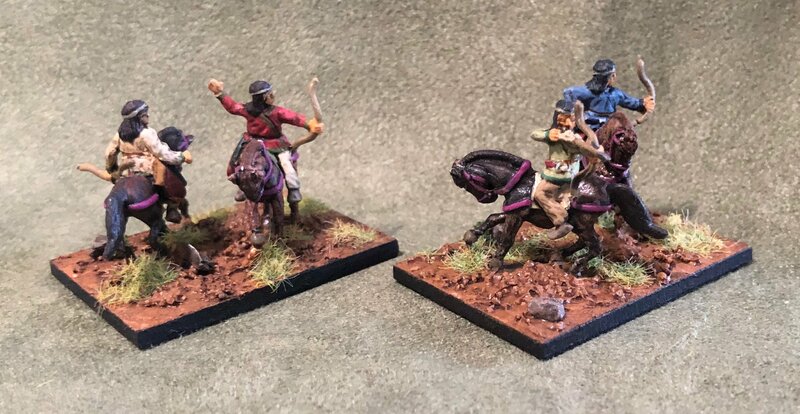 The slingers are from the Khurasan Arab range, the Dailami javelinmen are from their Khurasanian range, and the horse archers are Essex. 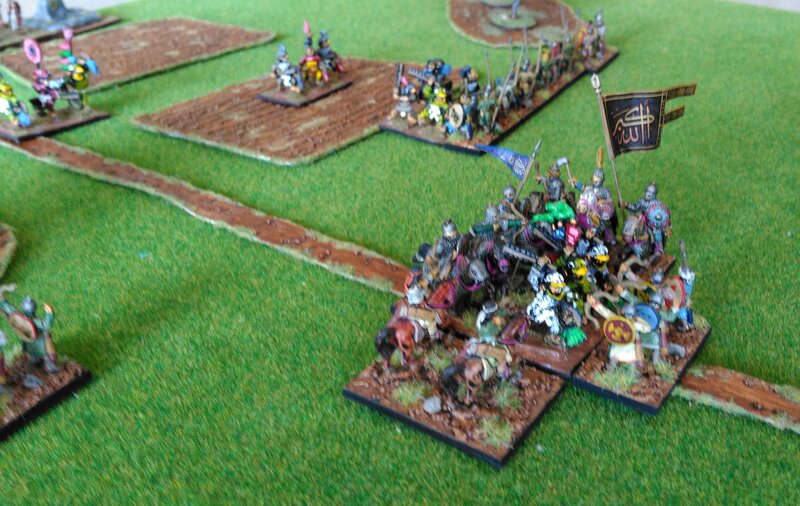 The Khurasan figures come in packs of 12; in order to justify getting the pack of figures with axes, I’ve sprinkled them through the other elements, as a form of officer. I’ll also be able to paint another three elements of these Dailami to use as a Dailami ally (III/58c) if I want. The shields have VVV transfers, which are probably designed for smaller shields. I’ve tried to compensate by painting the rims in a matching colour, but these don’t look as crisp. The photos of these and the previous post are taken with a phone, and not as good as I normally manage. The Mithridatic army has had an overhaul. Symbolic of this is the SCh. I’d stopped using it. Partly this was because it’s not that effective, but possibly as big a factor was that it didn’t look that good any more. It’s scythes bumped into everything; it disrupted its own battleline with them, and they got bent, looking shabby. I decided to shorten them. It may not look as dangerous, but it will be more attractive to put on the table. The old scythed chariot with longer scythes. 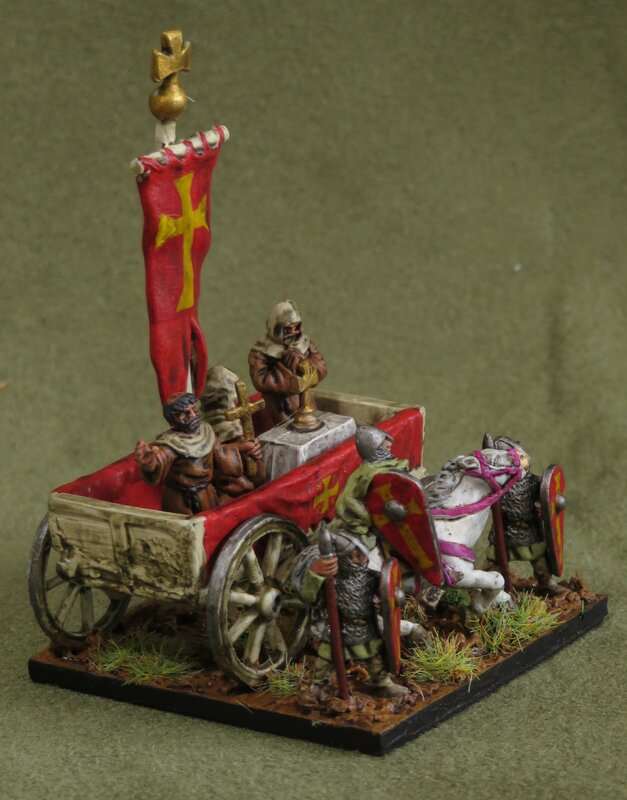 The renovated chariot with more manageable scythes. Otherwise, I’ve added five new elements of figures from Corvus Belli. One of these is Cappadocian infantry (3Ax). I now have two of these. The other four elements are imitation legionaries. 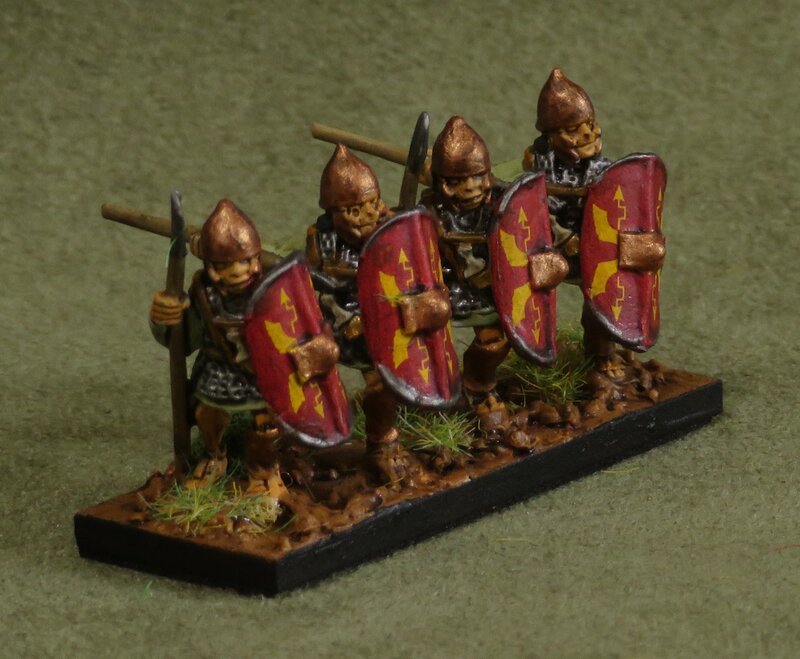 They are actually veteran Carthaginian spearmen, but are too good not to use as legionaries. 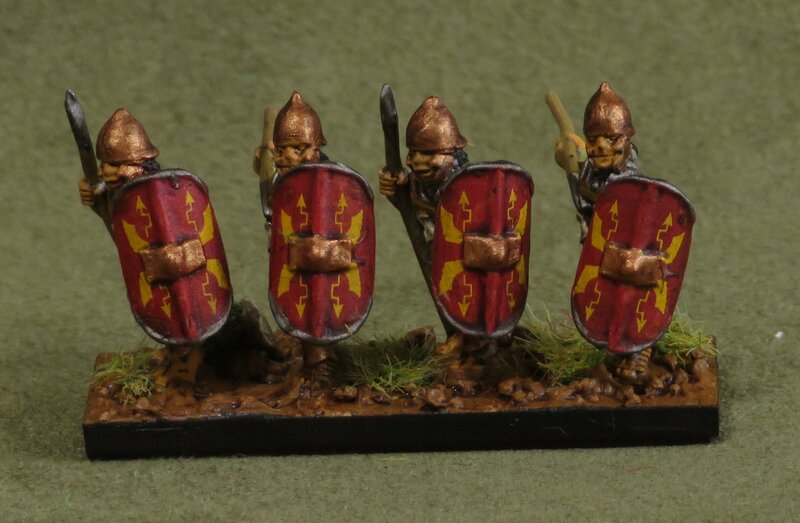 These have the same shield colours as the original Carthaginian spearmen. There are five more elements to paint, for BBDBA, and they will allow me to use them for a Mithridatic BBDBA army that has an Armenian ally. 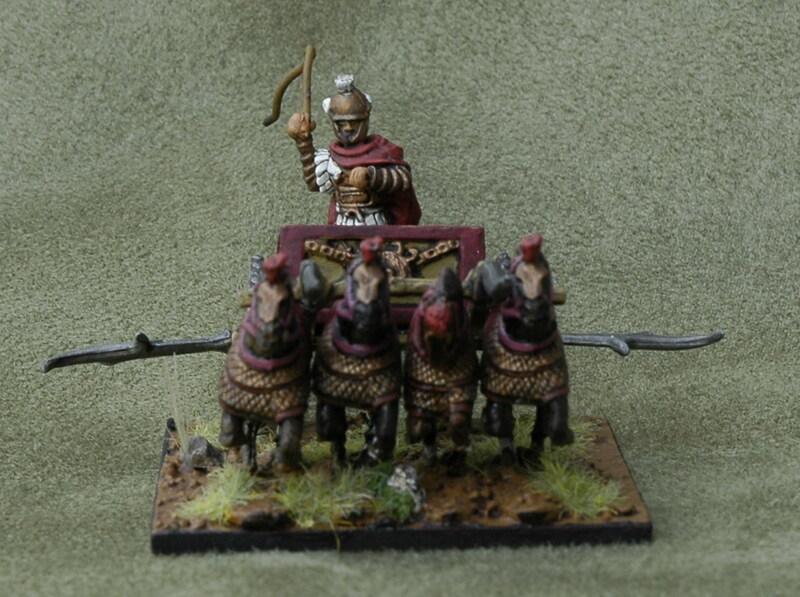 Speaking of Armenians, I have all the figures for an Armenian DBA army; this is not too high up the painting queue, but I have painted four elements of them to use as an ally for Mithridates; these are two elements of cataphracts (4Kn). 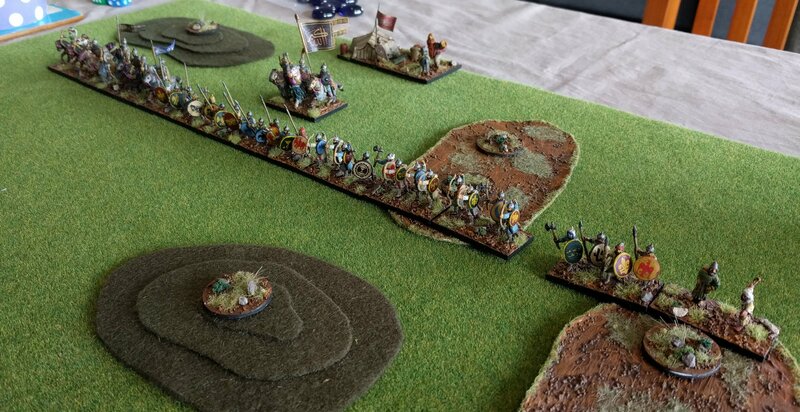 These are Freikorp figures, actually Parthians (after I bought them, Freikorp brought out an Armenian range). They have good poses, but the detail is not great in places, such as their faces. The other two elements are horse archers (LH). Along with the camp that I painted last month, this army is largely new elements. I’m hoping its TLC will make it fight better. Mithridates with an Armenian ally. I’ve got a few more elements finished, and a number more very close to being finished. 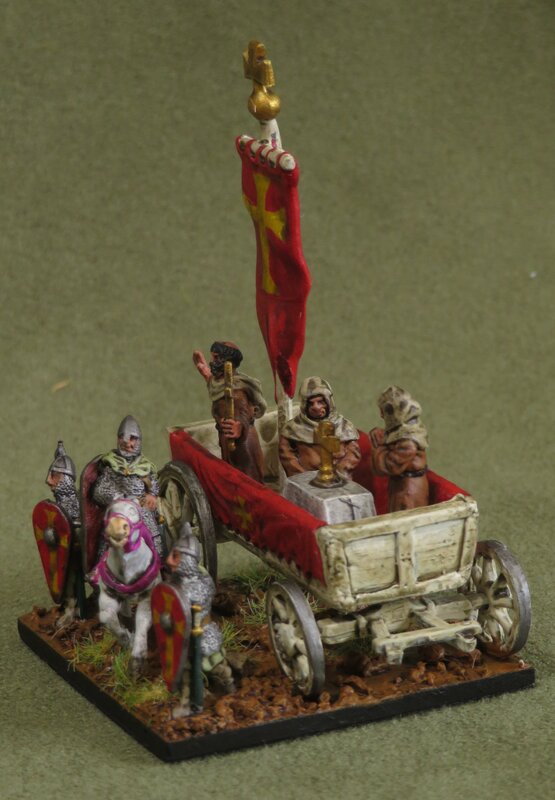 The first is the Command Wagon of my Communal Italian army (III/73a) that is taking shape. It is a morph of my Norman army, though I’m yet to paint most of it — the six elements of communal spearmen, the two elements of communal crossbowmen and the two elements of Contandini infantry (hordes). 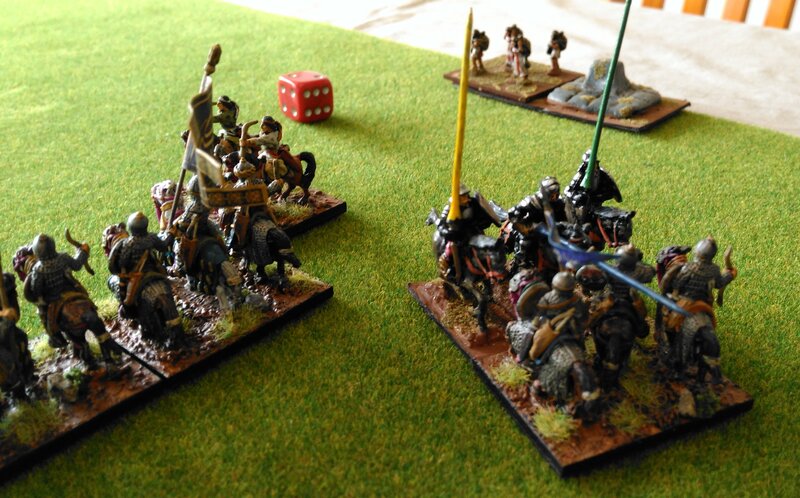 I’m actually planning to take a Medieval German ally (IV/13a), which allows more knights (3Kn/4Bd), and another element of crossbowmen. These are all started. 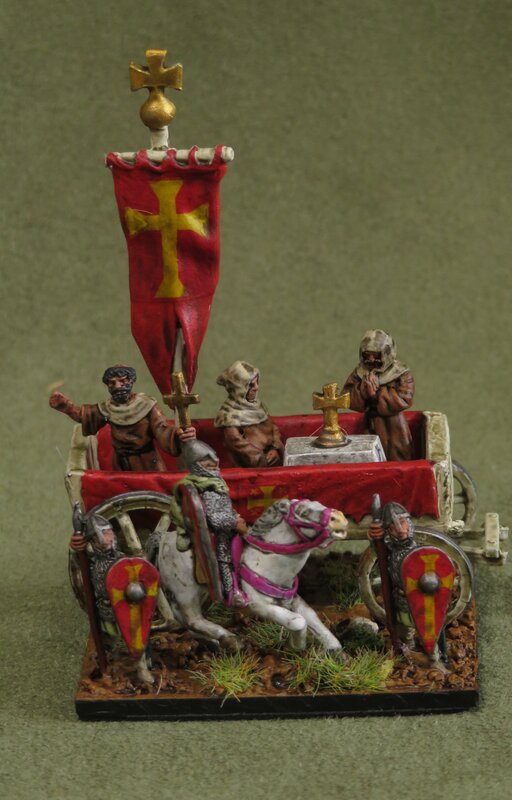 I made the transfers for the Carroccio’s banner and the shields myself. I was following the picture in Ian Heath’s Armies of Feudal Europe (no. 94 on p. 111). I noted that some of cities (Bologna and Parma) had red banners and a cross on them. I somehow took from this a yellow cross, though when I reread the book I discovered that it should have been white. Like the rest of the army, this is an Essex model. I chose to keep it to a 40 x 40 base, so I’ve not used the oxen. After I decided on this, I saw a very nice Carroccio with oxen. One advantage of the 40 x 40 base is that I can present the wagon side on. 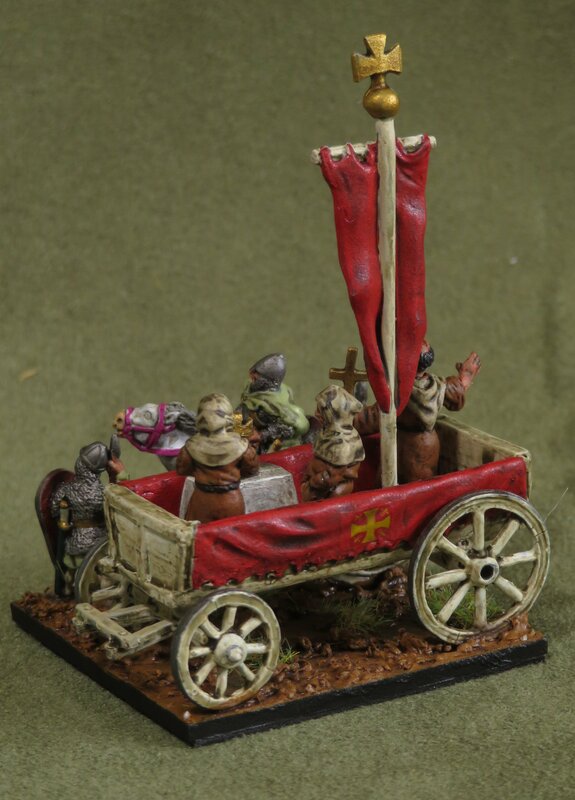 The model came with a single monk (the one holding the crucifix), but I came across a few more while I was painting it, and decided to fill out the wagon a bit. These monks have picked up some dirty habits, courtesy of refreshing the ink in my wash just before doing them! They’re not just there to add moral support either; that monk in the middle is kneeling. If he stands up he’s a monster (a Museum miniature) … Beppo abandoned his questionable early life as a wrestler for a life of prayer, but should the wagon be under serious threat, he may revert to his old character, so watch out! The wagon is guarded by a select guard of uniformed troops. The occasion that led me to finding the other monks was my decision to finish off my Mithridatic army. 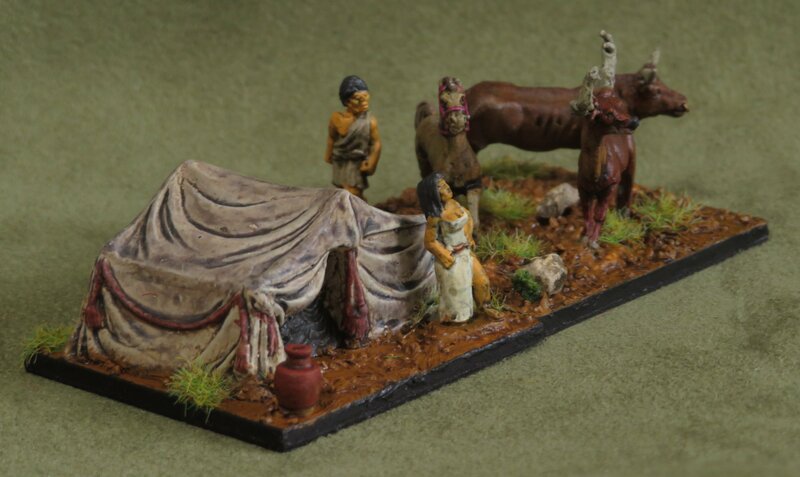 Part of the work is to do the camp— Mithridates tent— which was guarded, I believe, by a stag, a bull and a stallion. I’ve had these figures for a long time; I even started painting them, in a desultory sort of way, so it’s good to get them done finally. 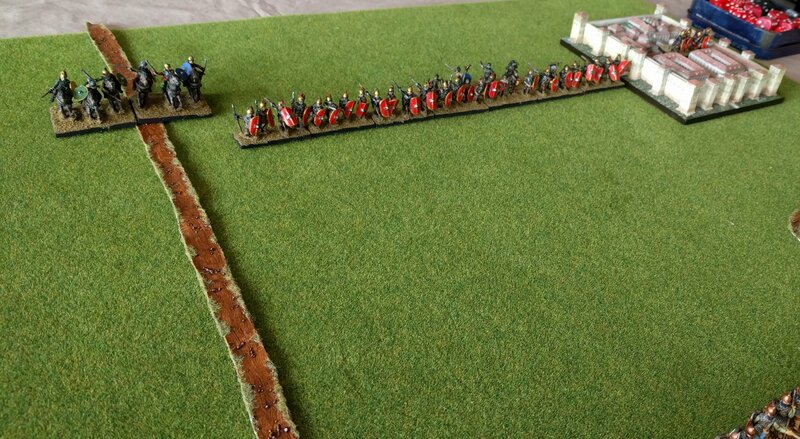 Mithridates’ army will be joined by an Armenian ally that can add more horse archers and some cataphracts. These are under way. I also decided that I could use the Carthaginian veteran spearmen as imitation legionaries, which would be an incentive to get them finished—well, some of them. 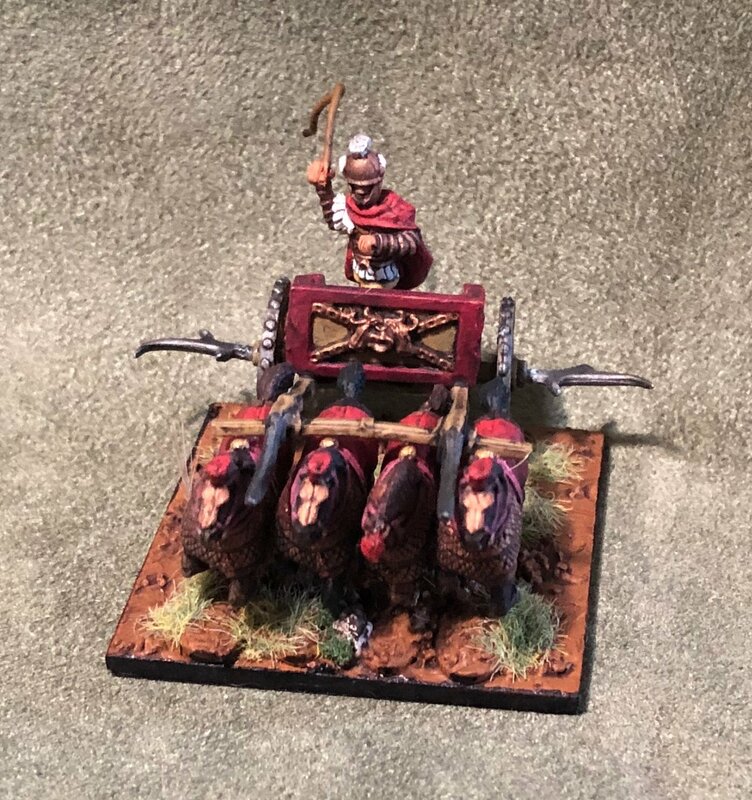 I’m also doing another element of Cappadocian infantry also by Corvus Belli. In all, this will represent eight new elements for the army (and a ninth if the camp is counted). 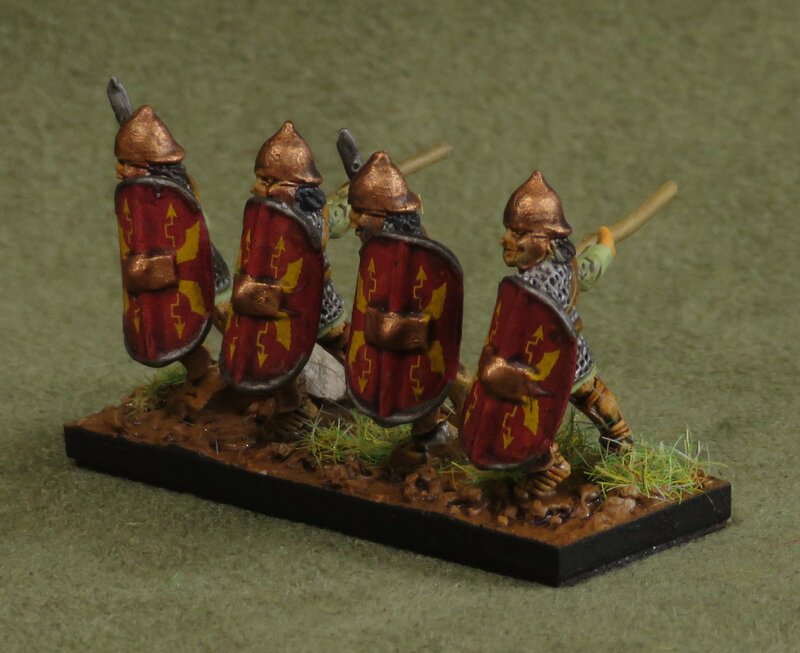 Here’s the first of the finished spearmen/imitation legionaries. 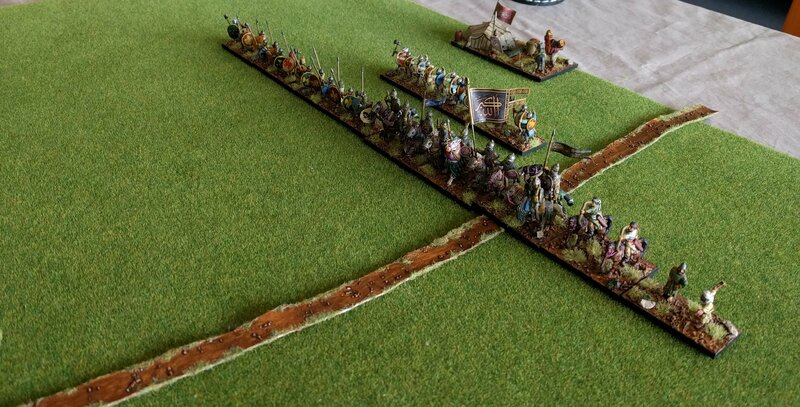 Once I’ve got the Armenians and Carthaginians done, it’s back to the Italian spearmen and crossbowmen (who got demoted in the painting queue last week). My painting output has dropped a bit in the last month, inasmuch as I’ve not got a lot of finished work to show. However, I have been busy organising my paint. It is now all in dropper bottles. 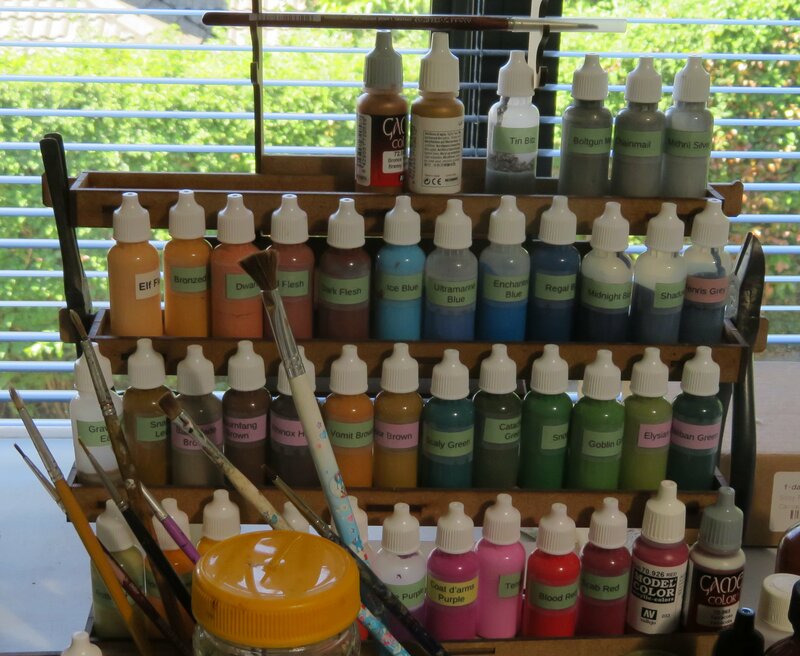 This was a slow and messy job, but a good chance to assess the quality of a some of my paints. They are a lot easier to use now, so I think it was worth the effort. Paints all in dropper bottles. 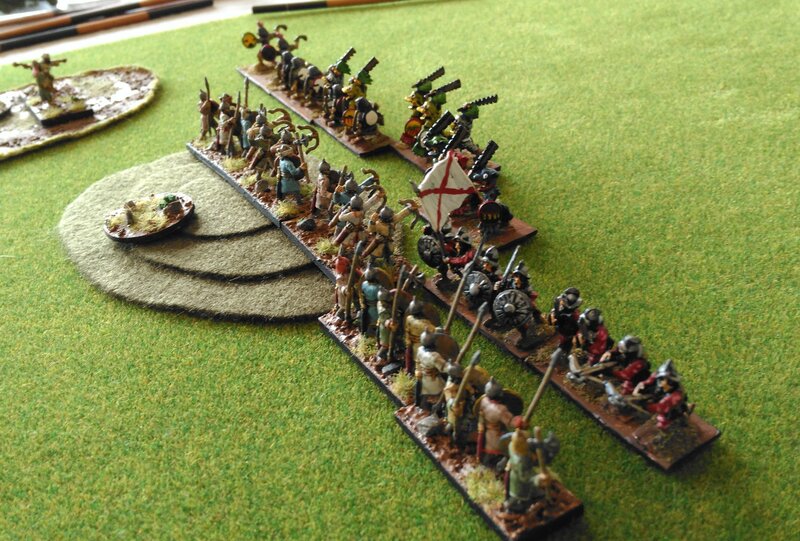 Otherwise, I have started painting the carroccio and the foot to morph my Normans into Communal Italians. I’ve done the shields, using mostly VVV decals, but also a few of my own that I made (I needed some decals for the carroccio, and added a few for the guards). I have also spent time buying boxes to store my figures in. 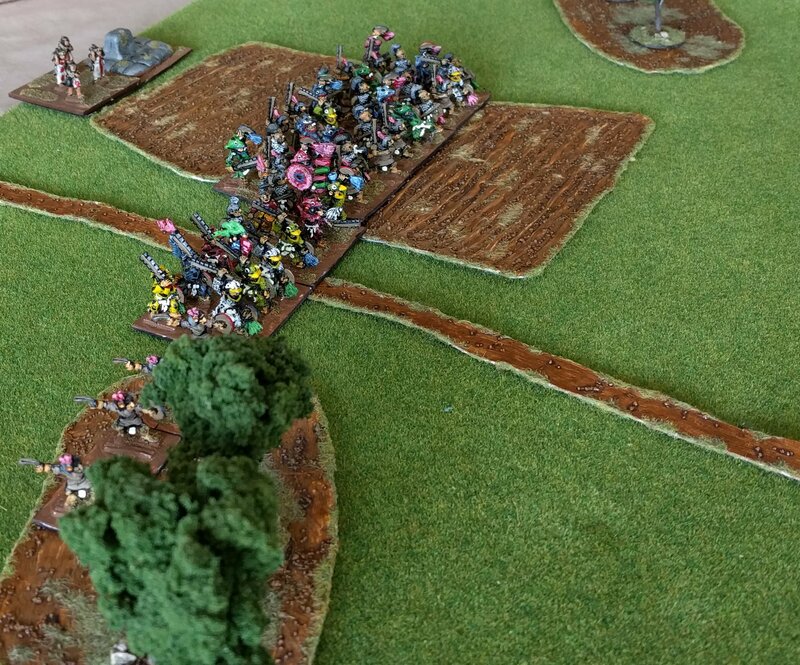 This occasioned my discovering some partly painted warbands for Song of Blades and Heroes. It didn’t take long to get them finished, which is quite satisfying. The figures are all Splintered Light, which come in irresistible warband packs (I have a lot more I could get done). The first warband is a group of Troglodytes; I painted a test figure of them two years ago, and I got the base colour done of the rest: link. They languished after that. I was not entirely happy with the colour, which was too similar to the lizardmen, despite using different colours for the base and drybrushing. I didn’t let that trouble me this time, and just got the detail done, which is not too much work. 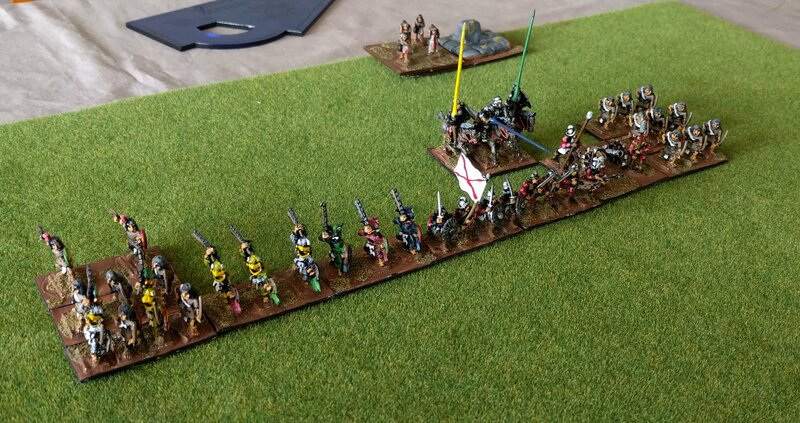 The warband has a commander and a shaman, and large chap and a pet lizard of some sort. 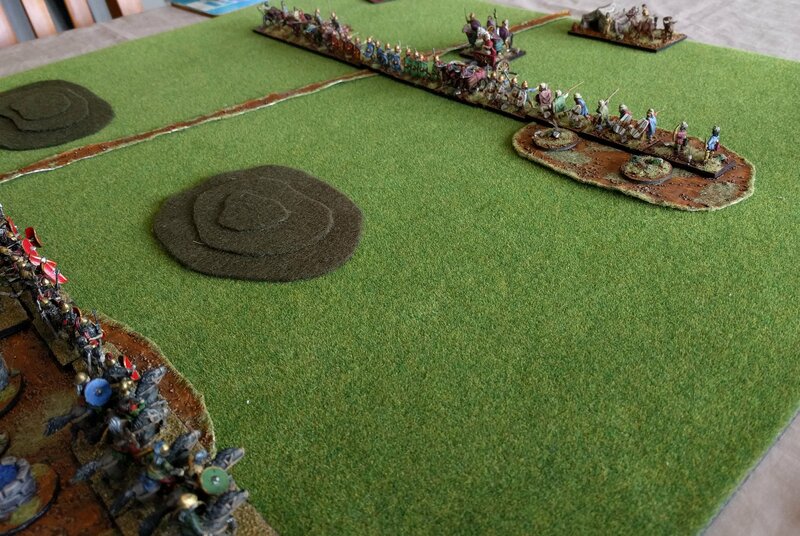 The other warband was some lizardmen. They were at the same stage as the Trolodytes, and didn’t take a lot of work to finish. They also have a commander and a shaman; they also have a larger chap with a trident. I hope to use these figures at some stage; I also would like to get the warband of ratmen painted. The base colour for them is done, and they should look great when finished. They would join quite an array of SoBH figures now. That’s two groups of figures that I’ve taken out of half-painted limbo. My Veteran Carthaginians remain in this place, but I’ve hit on a plan to get some of them done. I’m going to finish four elements of them to use as imitation legionaries for my Mithridatic army. Getting them done is likely to push the Communal Italians back down the queue!